Today we can say that RTC 4.0 will (certainly) provide a shell integration for Windows Explorer! Please check-out the great article from Sreerupa Sen: Introducing the Rational Team Concert Shell integration for Windows Explorer and you will learn what you can expect from this great feature. Regularly, the Jumpstart team members are invited to assist customers who either decided to adopt Rational Team Concert (RTC) and need to adapt their Maven build and deployment process to RTC or, as an “open source shop” wants to challenge RTC on this subject. Generally, the customer first impression, when we show the Maven/RTC integration, is pretty good. 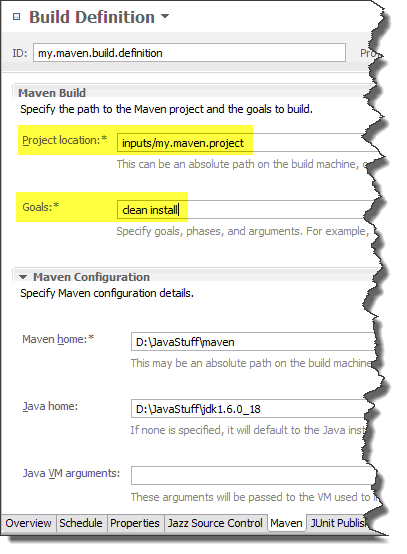 which Maven goals to reach during the build. That’s it! Unfortunately, this is not always so easy… Each customer I have met has had some particularities that I would like to share in his post. I recall when Paul Vanderlei invited me to join his new team, the first thing I did after his call was to google for Jumpstart. You can imagine, as a French native speaker, my surprise when I discovered that a “Jumpstart” is this device that helps you start a car. Since that time I understood what the Jazz project was expecting from our team: provide this (minimal) amount of energy which can help close a deal or deploy a Jazz workbench in a customer environment. Most of the Jumpstart team engagements are specific, so I would like to use this blog to gather some interesting points I learned with and/or I taught to my customers when they are suing a Jazz workbench like Rational Team Concert. Your feedbacks are very welcome. I will do my best to take them under consideration.